The two divisions of the enterprise Valentin Schmidt consist of furniture workshops and window/facade elements with conservatories. These two independent departments can converge to optimize the processes of a project. When necessary, we coordinate the relevant builder, drywaller, and electrician. Whether it’s a simple, single piece of furniture or a complex, built-in unit, the project will be developed alongside the customer from the idea to production, with the highest quality, accuracy, and craftsmanship. This promise is also true for the range of window and facade elements for conservatories. Along with the classic wooden windows and doors, Valentin Schmidt offers a wide variety of materials and combinations. Various models using plastic, aluminum, or aluminum and wood combinations are on display. The range is supplemented with plans and examples of conservatories as well as blinds, awnings, facade fixtures, and garage doors. Dependable planning - Our customers can see the plans as they’re drawn up. 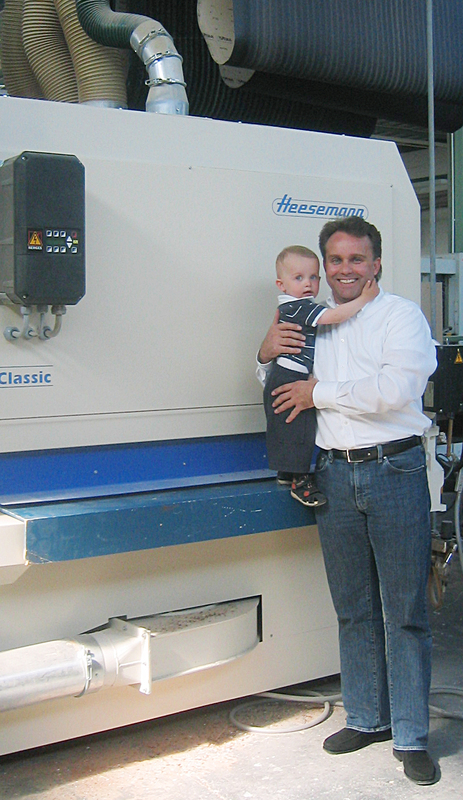 Quality control - We use state-of-the-art machinery and our employees are highly motivated and expertly trained. Adherence to schedules - You can rely on our high-performance team of 45 skilled workers and internal project management. Cost control - For over 115 years we have stood by our word: We are committed to market-friendly manufacturing and binding offers. The best thing for the future is experience: For over 115 years Valentin Schmidt has been the reputable, quality-conscious cabinet maker and Interior carpenter. Today it is fourth generation of the family business that is highly involved in modern and top-quality interior fittings, while keeping an open view of future standards. ...long, long ago, there was a cabinet maker’s apprentice, Valentin Schmidt from the town of Hessen. After his travels through the country, which is a tradition that craftsmen in Germany follow, he found himself in Hannover where he passed his exam, making him the master of his trade. He then set up shop on See Street at the age of 28 in the year 1893 and began working as an independent cabinet maker. Word spread of his tireless work and creative energy, which soon brought him many satisfied customers. So many in fact, that three years later, he bought property on Grotenfend Street 2. He was happy and proud to finally have his own ground beneath his feet, and there he built a multiple family residence which would be rented out to the officers of the Kings Counsel, since the garrison was nearby at Koenigswortherplatz. Directly behind the apartments, the master carpenter erected a building to house the officers’ horses, with the upstairs area serving as his new workshop. 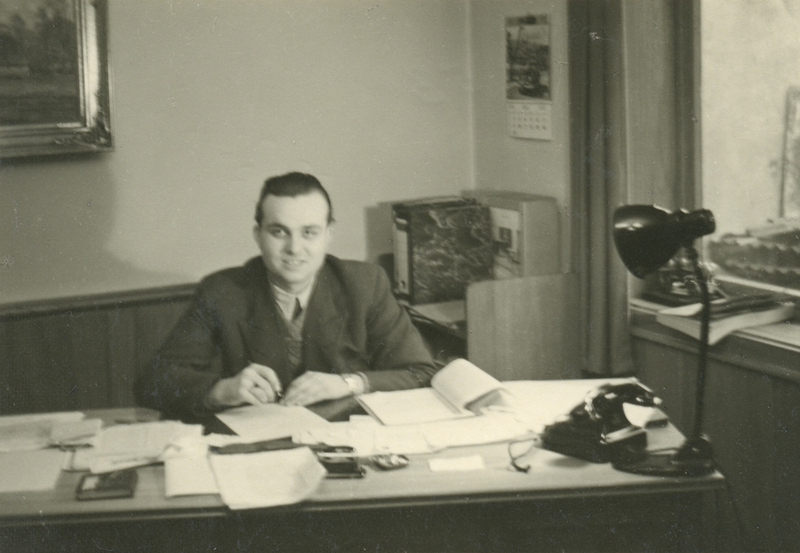 While he worked tirelessly, his son Valentin grew up and, after luckily surviving the first World War, he finished his studies and went to work alongside his father. Carpentry and cabinetry work of any kind was executed with utmost care. Business blossomed and other workers were hired. 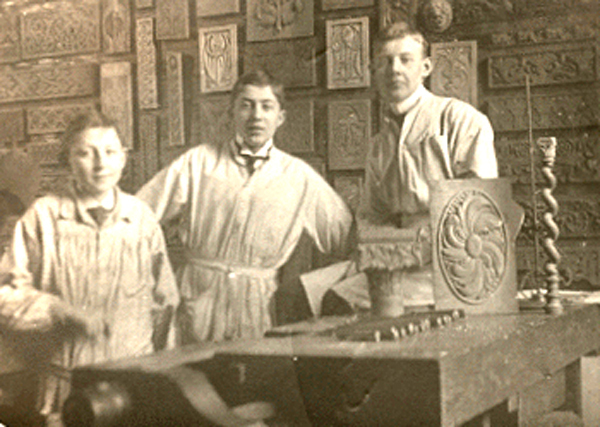 By 1930, Valentin Schmidt employed 15 assistants and apprentices. 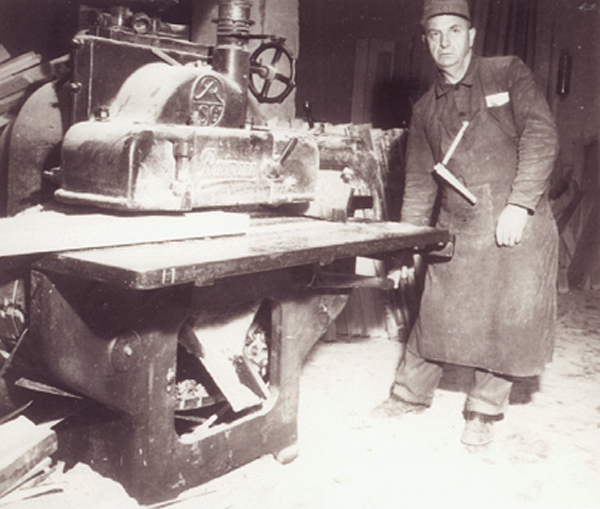 Since horses were no longer occupying the ground floor, the space was converted to accommodate the first roll sanding machine in Hanover which finished the wood surfaces. Back then, it was a sensational innovation. They could take on bigger projects such as the windows of the newly-built Anzeiger Hochhaus in 1928. Five years later, the entrepreneur Valentin Schmidt died at the age of 69, leaving a prosperous business to his son. Until the second World War, the business flourished by the hands of his successor who, through top quality work, established his good name well beyond Hanover. A bigger and newer warehouse for wood provided proper storage of pine, spruce, and oak. More property was bought, and by the beginning of the second World War, there was a workforce of 35 employees. The war dealt a heavy blow to the business, burning each of the buildings on Grotenfeld Street to the ground shortly before its end in 1945. With enormous commitment, Valentin Schmidt worked tirelessly to rebuild everything that the war had destroyed. In order to resume work, he started by preparing a one-storey cabinet-making workshop. He eventually extended the building and made more space for machines and equipment. Because seasoned lumber was unavailable after the war, logs from the forests around Hanover had to be cut and milled to the proper sizes. For Valentin Schmidt, it was imperative to acquire equipment for curing wood; a bold investment for cabinet-makers back then. 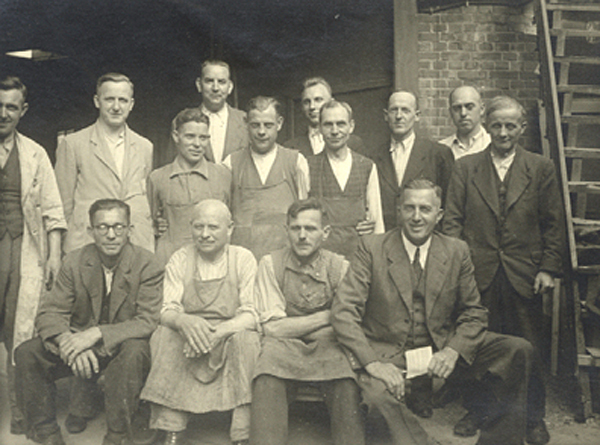 During the rebuilding of Hanover, those in the carpentry business had their hands full and the company grew to 80 employees. Along with cabinetry work, there was much-needed interior finishing to be done. Although the company recovered yet again, Valentin Schmidt Jr, who witnessed both World Wars, died much too young at the age of 52 in 1949. His oldest son, Helmut Schmidt was just 19 years old at the time so, for the time being, his brother-in-law Gustav Salge carried on the family business. When he was 25, Helmut Schmidt became the third generation to manage the company. The 50s brought on a whirlwind of advanced technology and machinery that was needed to make production more efficient. 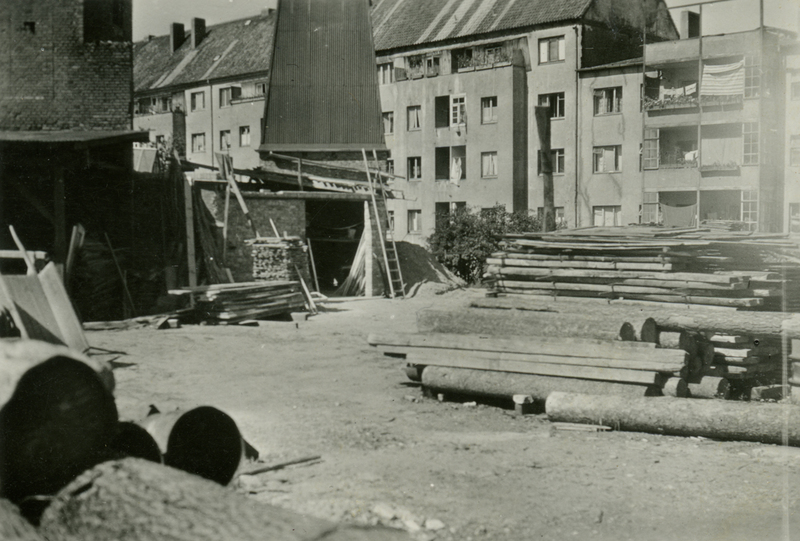 So in 1960, they built a modern workshop with about 5,000 square meters in the new industrial park of Hanover-Hainholz on what used to be Helmke Street, but is now Rehagen. With up-to-date and cost-effective facilities they could take on bigger projects at a considerably lower cost. When Gustav Salge died in 1968 at the age of 81, Helmut Schmidt became the sole proprietor of the company. In 1969, the temporary office on the factory floor was moved to a new building and the product line was expanded to include windows with wood and plastic combinations, and later, plastic windows with multi-chamber profiles. There was another good reason in 1975 to build a new factory for wood and plastic windows: that same year, Helmut and his wife, Ilse, succeeded in promoting the company to corporate status: a limitied liability company. Today Valentin Schmidt has an even 50 employees, who for years have been providing first-class quality with expertise and modern plastic and woodworking machinery. Every project, still today, is carried out with utmost care and a love for detail. Although we celebrated our first centennial in 1993, we haven’t stopped looking to the future: our office building will be redesigned and expanded. The building now covers an area of over 3,250 square meters for production, office space and staff facilities where creative power and enthusiasm for the work thrives. In the mean time, the fourth generation is still growing up. He was born almost exactly 100 years after the founder was born and after finishing his training joined the company in its centennial year. In the following years, computer-aided manufacturing processes (CAD/CAM) were adopted by the business, helping to keep a competitive edge, and ensuring that market-friendly manufacturing is the basis of their future success. That the fifth generation came into the world that same year could be a coincidence. Valentin III was born almost 140 years after the founder was born. The company Valentin Schmidt is known for high-quality interior fitting, window and facade elements, and conservatories. Non-corporate customers, companies, public establishments, administrative buildings, and housing companies and associations have benefitted in the 115 years of experience with the company and the skilled workmanship of the dedicated employees. 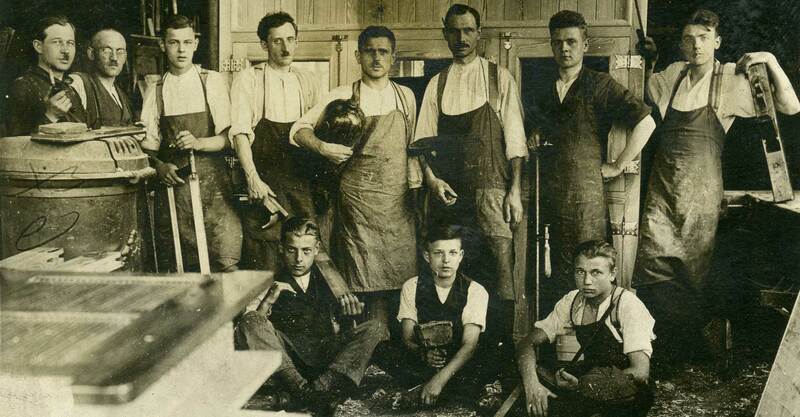 For over 115 years Valentin Schmidt has been the reputable, quality-conscious cabinet maker and Interior carpenter.